General C. Robert �Bob� Kehler is Commander, Air Force Space Command, Peterson Air Force Base, in Colorado. He is responsible for organizing, equipping, training, and maintaining mission-ready space, cyberspace, and missile forces and capabilities for North American Aerospace Defense Command, U.S. Strategic Command, and other combatant commands around the world. General Kehler oversees Air Force network operations; manages a global network of satellite command and control, communications, missile warning and launch facilities; ensures the combat readiness of America�s intercontinental ballistic missile force; and is responsible for space system development and acquisition. He leads more than 43,000 professionals, assigned to 86 locations wordwide and deployed to an additional 35 global locations. General Kehler entered the Air Force in 1975 as a distinguished graduate of the Air Force ROTC program. He has commanded at the squadron, group, and wing levels. He has a broad range of operational and command tours in ICBM operations, space launch, space operations, missile warning and space control. He commanded a Minuteman ICBM operations group at Whiteman AFB, Missouri, and the Air Force�s largest ICBM operations group at Malmstrom AFB, Montana. He served as Deputy Director of Operations, Air Force Space Command; and commanded the 30th Space Wing at Vandenberg AFB, California, and the 21st Space Wing, Peterson AFB, Colorado. Most recently, as Deputy Commander, U.S. Strategic Command, he helped provide the President and Secretary of Defense with a broad range of strategic capabilities and options for the joint warfighter through several diverse mission areas, including space operations, integrated missile defense, computer network operations and global strike. The general�s staff assignments include wing-level planning and tours with the Air Staff, Strategic Air Command headquarters and Air Force Space Command. He was also assigned to the Secretary of the Air Force�s Office of Legislative Liaison, where he was the point man on Capitol Hill for matters regarding the President�s ICBM Modernization Program. As Director of the National Security Space Office, he integrated the activities of a number of space organizations on behalf of the Under Secretary of the Air Force and Director, National Reconnaissance Office. General Kehler, as the commander of Air Force Space Command, would you please inform our readers as to the breadth of your organization and its responsibilities? As commander, I am responsible for the development, acquisition and operation of the Air Force�s space and missile systems. I also oversee a global network of satellite command and control, communications, missile warning and launch facilities, and ensure the combat readiness of America�s intercontinental ballistic missile force. We are also standing up 24th Air Force under the command, which will operationalize the cyberspace mission for the Air Force. We have more than 39,000 talented space professionals in this command who provide combat forces and capabilities to North American Aerospace Defense Command and U.S. Strategic Command. Simply stated, the mission of Air Force Space Command (AFSPC) is to provide an integrated constellation of space and cyberspace capabilities at the speed of need. Our vision is to be the leading source of emerging and integrated space and cyberspace capabilities. How were you able to accomplish bringing the various space wings together into more integrated roles? Space is global and dynamic in nature and the five wings under the 14th Air Force take on the critical space operations missions. The Joint Space Operations Center (JSpOC), located at Vandenberg AFB, California, uses the Joint Space Tasking Order (JSTO) process to help integrate space capabilities and global space effects AFSPC offers to the warfighter. Through the JSTO, the JSpOC operationally integrates the wings and 29 joint space systems to deliver global and theater space effects. On a daily basis, the JSpOC integrates space capabilities and delivers global space effects to include SATCOM; Positioning, Navigation and Timing; Intelligence, Surveillance and Reconnaissance (ISR); missile warning and defense in support of the combatant commanders and our allies. The JSpOC also works with commercial and foreign agencies by using multiple space sensors to develop the best-possible space situational awareness picture and predict conjunctions and collisions. In December of 2007 you stated, �The space capabilities we provide today are embedded in all of our combat operations. They�re also embedded in our military operations, short of combat, across the board. In fact, we cannot fight the way America fights today without space capabilities.� What capabilities were you referring to, and where will these capabilities need to be over the coming years? The mission of the U.S. Air Force is to fly, fight and win�in air, space and cyberspace. The Air Force has played a central role in the development of space capabilities that are vital to our National security, economic growth, public safety and welfare. Some of our core functions include assuring the Nation�s access to space, protecting our freedom to operate in space and providing Joint warfighting capabilities from space. Specifically addressing future MILSATCOM capabilities, the Wideband Global SATCOM (WGS) System provides essential communications services for combatant commanders to command and control their tactical forces. It provides a quantum leap in communications bandwidth for our Soldiers, Sailors, Airmen and Marines. In the same vein, the Advanced EHF (AEHF) system, slated to launch in Fall 2010, will provide more survivable, jam-resistant, worldwide, secure communications with a ten-fold increase in capacity and more than five times the data rate of Milstar. GPS is the most well known and prolific space capability. The Air Force and AFSPC have been the diligent stewards of GPS since its conception in the 1970s and continue this commitment to such a critical component of our National Infrastructure. The current GPS constellation has the most satellites and the greatest capability ever. We strive to improve service and capability through on-going modernization efforts. The Air Force will continue to pursue an achievable path maintaining GPS as the premier provider of positioning, navigation and timing (PNT) for the military and civilian users around the world. Today, we have 30 satellites orbiting the Earth, which provide persistent PNT signals across the globe. We also have three spares in orbit and a new satellite going through operational checkout. Since we declared Full Operational Capability in 1995, the Air Force has maintained the constellation above the required 24 GPS satellites on orbit. Our space-based ISR assets provide critical support to the joint warfighting team. These ISR assets play an integral role in programs including the Defense Meteorological Satellite Program (DMSP), Defense Support Program (DSP), and Space Radar. Many ISR systems were not specifically designed to support tactical battlefield operations as their primary mission, yet their services have become essential to warfighting capabilities. The Battlespace Awareness mission is an area where we can use sensors differently from their original intent delivering capability to the warfighter that can make a difference in the outcome on the battlefield. For example, the Space-Based Infrared Systems (SBIRS) High (HEO) sensor can detect heat or hot gasses from missiles and other man-made objects as designed. But it can also detect terrestrial events like volcanic eruptions and wildfires, as well as weather data from clouds and storms. In addition, our weather satellites are absolutely essential in planning and conducting operations given they provide awareness of the space environment for events such as solar flares and solar flux, as well as conditions on the ground. The overall picture these satellites provide our planners afford greater fidelity in planning worldwide operations and establish parameters for critical products such as the air and space tasking orders. How can the services protect our space capabilities within hostile environments and, if possible, can you mention some of the vulnerabilities that were overcome to benefit our Nation and our warfighters? Space is one of many domains through which we conduct activities to support military operations. By building robust architectures (i.e. redundancy, alternative means) for warfighter support functions, we make it more difficult for an adversary to disrupt or deny our military capabilities. We also continue to increase our knowledge of our adversaries� concepts of space operations to better understand their actions. This increased understanding improves our space situational awareness capabilities allowing us to better monitor and respond to activities in space that may put our systems at risk. We are also looking at concepts to directly protect space systems and, if necessary, rapidly augment or replace critical space capabilities through our Operationally Responsive Space initiative. Finally, we are taking steps to protect the entire architecture which includes space, link and ground segments. Because the ground segment is the most accessible of the three segments, we employ numerous measures to ensure physical security. These measures mitigate our risk and make it more difficult for an adversary to degrade or deny a space capability. Secure satellite communications are important in what ways? Protecting, sustaining and employing our capabilities while preventing adversaries from deterring or denying our freedom of action during a conflict is central to our mission effectiveness in the Joint fight. We provide protected communication for our Nation�s leaders, combatant commanders and warfighters, who will continue to demand space, cyberspace and related capabilities that are responsive, flexible and integrated with other warfighting elements. These capabilities must be assured. Specifically, secure communications give us the ability to exchange information without undue concern that our adversaries will have access or will be able to deny or disrupt our critical communications. Today, all our military satellite communications use encryption to ensure information remains secure. In addition, we�re providing more �protected� communications that operate in the presence of jamming, which is a growing threat. What links are necessary between the space and ground segments to improve functionality? The Air Force maintains a worldwide network for control of satellites called the Air Force Satellite Control Network (AFSCN). This network is our primary method for the control and maintenance of all DoD satellites. However, there are far too many satellites for the AFSCN to maintain a continuous link to each satellite, so use of the AFSCN is scheduled and apportioned for our systems. Many new satellites � especially communications satellites �� are designed to be continuously reconfigured to meet user needs. 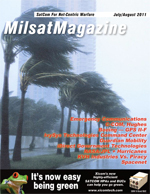 For example, Wideband Global SATCOM satellites and Milstar satellites have complex on-board signal routing and antenna pointing systems that must respond to warfighter needs real-time. To provide this full-time control, each satellite�s communications capacity is shared between the communications of the warfighter and the control of the satellite � a process called �in-band satellite control.� This creates a control link that parallels and supplements the AFSCN, freeing the AFSCN for the precision orbit control, anomaly recovery and �behind the scenes� maintenance. Each new generation of satellite increases this in-band control as the satellite�s mission becomes more complex and response time becomes more important. In the end, both the AFSCN and in-band control are necessary. What does the term �land-based strategic deterrent� encompass within your command? What role do satellite communications play? Our land-based strategic deterrent remains the ultimate backstop of our Nation�s security, dissuading our opponents and assuring our allies through extended deterrence. Our Nation�s security relies heavily on the enduring attributes of the Minuteman III Intercontinental Ballistic Missile (ICBM) force and the professionalism of those who secure, maintain and operate it. We remain dedicated to ensuring a credible, safe and combat-ready ICBM force that convinces potential adversaries of our commitment to defend our Nation, its allies and friends. The Minuteman III ICBM force provides AFSPC�s contribution to the Air Force�s nuclear strategic deterrent infrastructure alongside B-2 and B-52 bomber aircraft. Once Air Force Global Strike Command becomes operational, it will assume responsibility for the Minuteman force. The credibility of the deterrent force depends on the ability for the President to unambiguously command and control U.S. nuclear forces. This is facilitated by a redundant, assured communications capability. Satellites such as Milstar and, in the future, Advanced EHF, in addition to ground facilities and airborne platforms, all ensure messages are received regardless of adversary attempts to compromise communications links. Product procurement has necessitated lengthy approval processes before a much-needed program can be incorporated into a working mission. Do you see the Air Force working to ensure effective space capabilities can be deployed more quickly? How will such be accomplished, given the past procurement process histories? In today�s world of rapid technological advancement and proliferation, we must deliver capability to the warfighter faster. We require a new strategy to develop, deliver and sustain space and cyberspace systems that is more agile and responsive than traditional acquisition processes and management methods. In order to accomplish this, we will have a disciplined, repeatable process to ensure validated requirements are established with users, properly vetted and documented and only adjusted through a deliberate process. This strategy demands a new approach that deploys defined end-state capabilities at the speed of need, within government cost estimates. Since there are no re-visits in space, the necessity of providing the warfighter the best possible system from day one drives the acquisition system to place a premium on performance, sometimes at the detriment of cost and schedule. We are more sensitive than ever to the need to get capability into the warfighters� hands, but as with most acquisition lessons learned over the last decade, this involves a delicate balance between cost, schedule, performance and risk. Over the past decade, the Air Force has been focused on using an evolutionary approach for rapid acquisition of mature technology for our warfighters. We have implemented a �Back to Basics� philosophy and a Block Approach Strategy, which allows us to quickly field new capabilities and deliver improvements in increments. During the 2008 Interservice/Industry Training, Simulation and Education Conference, the 711th Human Performance Wing�s Warfighter Readiness Research Division demonstrated tools for interactive military training using gaming technology. It resulted in lower training costs, but how effective is the method of training for space career fields? Could such training be used beyond flight and air combat training; for space command training? We believe the use of gaming technology will be very effective for our Space Operator training needs. With a product we call the Standard Space Trainer, or SST, we are well on the road to implementing this type of technology for our Space Ops simulators training program. We have recently completed a proof-of-concept to demonstrate and validate our SST vision which employs commercial off-the-shelf (COTS) PC hardware and operating systems, in addition to the use of gaming technology. In 2008, we awarded a contract for a full production SST architecture to be delivered in 2010. This framework will enable any space system trainer to be built on a PC-based COTS hardware solution, without reliance on the actual operational mission hardware or software. These are just the first of many steps we are taking to improve our Space Operations training program. We are also very interested in and supportive of Air Combat Command�s initiatives to improve distributed and virtual training. We see a big role for space in these and other �live� training activities conducted by the USAF Warfare Center. What are your perceptions regarding the current efforts by much smaller, privately-held companies in the design, manufacture and delivery of launch vehicles for use by the military? We strongly encourage new U.S. commercial space transportation capabilities that demonstrate the ability to reliably launch intermediate or larger payloads. \Further, it is important for AFSPC to support and employ measures to preserve a healthy techno-industrial base and supporting work force. AFSPC is preserving funding for technology development independent of acquisition programs and considers industrial base implications when making contract award decisions to enhance the health of the techno-industrial base. AFSPC must have agile and responsive development and acquisition processes in place to meet that challenge and must field new systems that meet or exceed performance, cost, and schedule goals while providing decisive, war-winning advantages. In addition, we must plan and invest wisely, ever mindful of growing resource constraints. Any company that can help us meet these goals will be considered. Do you see the �less costly and quicker into orbit� micro, mini, pico, nano satellites as having a role to play in future space command scenarios? In the last two years, academia has clearly demonstrated small satellites can be used for science and technology maturation applications. We are working with the labs to conduct our own research across the Air Force. For example, in May, the Tac-Sat 3, was launched into low Earth orbit. This project being run by the Air Force Research Lab is part of our Operationally Responsive Space Program. While this is a technology demonstration, it shows that we can field and deploy spacecraft for particular theater combatant commander needs. Over the next year, it will demonstrate new technologies, such as hyperspectal imaging, as well as other capabilities. In addition to Tac-Sat, we have another program called ORS-1 responding to an urgent imagery requirement in USCENTCOM. It will use the existing space-ground link the U2 uses today. When the satellite flies over the USCENTCOM theater, this satellite will be received as if it is a high altitude U2. In many cases, we may be able to do some substantial work with many small satellites. However, in some cases, we are going to need larger platforms. All things considered, we do see tremendous potential in being able to put another strategic bow in our quiver with smaller satellites. They are great for the Nation and for industry, and they give the warfighter potential for �on-call� services downrange. In addition, they provide an opportunity to standardize design techniques and lower our launch costs. Are there new technologies coming online that will prove to be an asset to your command? Could you discuss these advances? We make it a point to support and employ measures that preserve a healthy techno-industrial base and supporting work force. There are several exciting technological advances I would like to highlight. The first is our Space Optical Communications technologies which hold promise of providing significantly higher data rates with a reduced susceptibility to interception and jamming. These increased data rates will support airborne and space Intelligence, Surveillance and Reconnaissance (ISR) platforms and missions, such as unmanned aerial systems with optical data rates 10 to 100 times higher than radio frequency rates. Second, our Geodesic Dome Phased Array Antenna (GDPAA) is currently in an Advanced Technology Demonstration at Schriever Air Force Base to display technology readiness for S- and L-band phased array antenna to support satellite operations. If successful, the GDPAA will provide many benefits to include greater responsiveness, enhanced flexibility and increased robustness for our satellite operations. In addition, we continue to demonstrate and develop net-centric and Service Oriented Architectures (SOA) for the Net-Centric Satellite Operations (SATOPS) Enterprise Management, which will enable consolidation of functions and capabilities, reducing duplication and improving interoperability between SATOPS and Space Situational Awareness and Command and Control Enterprises. Finally, AFSPC is depending on the ingenuity and innovation of industry to provide breakthrough technologies, such as new propulsion systems. We need to look at this idea of having a family of motors which serve a variety of launch platforms across the services as well as organizations outside the Department of Defense. Such an initiative would bring tremendous benefits to our industrial base and would help government to lower costs for system procurement, operations and maintenance. Looking ahead, what challenges do you see that need to be addressed/countered as quickly as possible for our Nation to remain secure? AFSPC has always met today�s mission needs while looking to the future, and we have never been content to accept status quo. Tomorrow�s national security challenges will demand that we think differently, organize efficiently and that we ensure space and cyberspace power is more responsive, is always assured, that it contributes decisively and is developed and wielded by Airmen and civilian professionals who are recognized as both technical and tactical leaders. The global security environment is dynamic and requires our forces to be flexible to meet the needs of the Combatant Commanders and other national users who may be engaged across the spectrum of conflict or in non-military contingencies at any time. Furthermore, our forces will operate across increasingly contested domains. Protecting, sustaining and employing capabilities while preventing adversaries from deterring or denying U.S. freedom of action during a conflict is central to mission effectiveness in the Joint fight. These capabilities must be protected. In addition, the cost on new weapons� programs has significantly increased while the share of the federal budget dedicated to defense spending will likely decrease. On top of that, we�re facing a decline in our defense industrial base. We�re dealing with a crisis in the workforce with estimates projecting a shortfall in experienced scientists and engineers supporting space science and technology development. Finally, we have continued concerns over system cost, schedule, and performance. Air Force Space Command will require new approaches to rapidly produce the capabilities needed in this Information Age. Agile acquisition to meet requirements at the speed of need will allow our warfighting commands to meet the challenge of protecting our Nation, as well as our friends and allies. Thank you for your valuable time, General, and also for your dedication to serving our country.